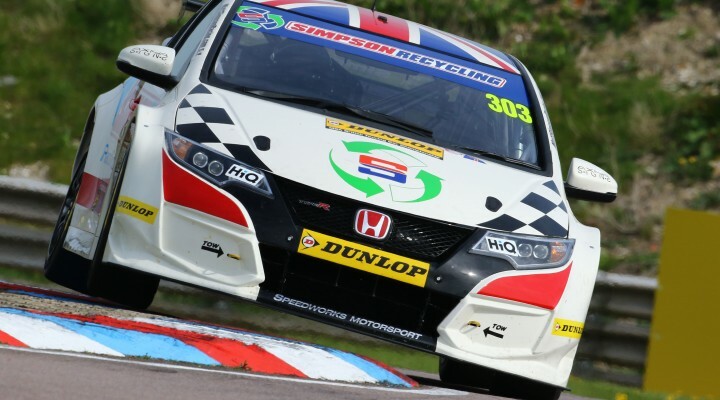 It’s Matt Simpson’s debut season in the Dunlop MSA British Touring Car Championship, driving the Speedworks Motorsport-backed Honda Civic Type R, and the Middlesex racer is enjoying the challenge, and the buzz, of what has been an educational first five events. Simpson’s elbows-out racing experience is derived from a schooling in the Quaife Intermarque championship, where the 34-year-old racked up a host of high-level honours and achieved great success. Back-to-back Quaife Intermarque titles came in a Vauxhall Tigra in 2013 and 2014. Prior to that, he was a leading protagonist on the Hot-Rod scene, clinching the European laurels in 2009 and 2011 and finishing runner-up in the World Championship in 2008 and 2009, and third in 2012. The BTCC has proved to be a different kettle of fish for Simpson, who has spent the vast majority of his career driving rear-wheel drive ‘silhouettes’ and hot-rods. He spoke to btcc.net to discuss the aftermath of what was a fruitful Snetterton test back in June. “It was great to be able to clock a bit more mileage and get a bit of track knowledge together as well as I’d only raced at Snetterton two or three times before in the past,” said Simpson. “The front-wheel drive is also a massive learning curve for me from what I’ve raced in the past – I’ve been rear-wheel drive for a big part of my racing career. Two 13th-placed finishes and points at Thruxton were a particular highlight of Simpson’s 2016 campaign on a circuit that undoubtedly played to both his and his car’s strengths. The former Hot-Rod champion prefers to be in the heat of battle, slicing and dicing for position and the high-speed Hampshire circuit is one that rewards the duelling driver with many an opportunity to overtake. Simpson is hoping that the second half of 2016 will yield further progress as he aims to further familiarise himself with the demands of the championship ahead of a second bite at the cherry next season. “It’s been a massive learning curve to be fair but we’re making steps forward and we’re hopefully going to keep improving to come back bigger, better and stronger for next year. There’s a massive fan base and the popularity of the series makes it such a great series to be part of – it’s such a buzz.